Born in Westminster, MD, a native of Union Bridge, MD, and a 2001 graduate of Walkersville High School, Staff Sergeant Charles Cartwright enlisted in the Marine Corps on Sept. 10, 2001. Sgt. Cartwright was an avid runner and surfer who enjoyed competing in marathons and triathlons. 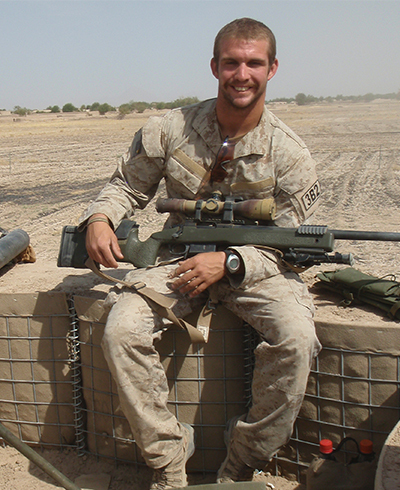 He began his career as a rifleman, later becoming a Reconnaissance Marine in May 2006 and joining MARSOC soon after the unit was formed. While on his fifth deployment, on Sept. 5, 2009, SSgt. Cartwright came under heavy fire, quickly oriented on the enemy, assaulted, killed two combatants and was then wounded. He continued the fight, exposing himself under intense fire to save a severely wounded Afghan soldier. For those actions, Sgt. Cartwright was awarded the Silver Star on Nov. 10, 2011 (posthumously). While with 2nd MSOB, during the same deployment that earned him the Silver Star, SSgt. Cartwright was killed during a combat patrol in Farah Province. SSgt. Cartwright’s personal decorations include the Silver Star (posthumously), two Purple Hearts, Navy-Marine Corps Commendation Medal, Navy-Marine Corps Achievement Medal with combat V, two Combat Action Ribbons, and three Good Conduct Medals. SSgt. Cartwright was promoted to Staff Sergeant posthumously on November 10, 2011.